Seattle, WA – Internationally acclaimed hip-hop artist Talib Kweli will perform with a full live band at a free concert at Showbox SoDo in Seattle on August 19th from 6pm - 11:30pm, as part of the nationwide Rock Against the TPP tour, a series of large-scale concerts, teach-ins, and protests mobilizing to raise awareness about the Trans-Pacific Partnership (TPP) agreement, the unpopular, anti-democratic “trade” deal that has been a hot topic in the presidential election. Other high profile participants in the August 19th event include Golden Globe nominated actress Evangeline Lilly (Lost, The Hobbit, Ant-Man), comedian Hari Kondabolu, popular punk band Anti-Flag, Hawaiian slack-key guitar legend Makana, Danbert Nobacon of UK sensation Chumbawamba, Sierra Club executive director Michael Brune, and buzzworthy bilingual rockers Downtown Boys. Organized by legendary guitarist Tom Morello (Prophets of Rage, Rage Against the Machine, Audioslave), his new label, Firebrand Records and digital rights group Fight for the Future, the tour is sponsored by Citizens Trade Campaign, Communications Workers of America, CREDO, Demand Progress, Friends of the Earth the International Labor Rights Forum, Public Citizen, Sierra Club, SumOfUs, the Teamsters, and Washington Fair Trade Campaign. 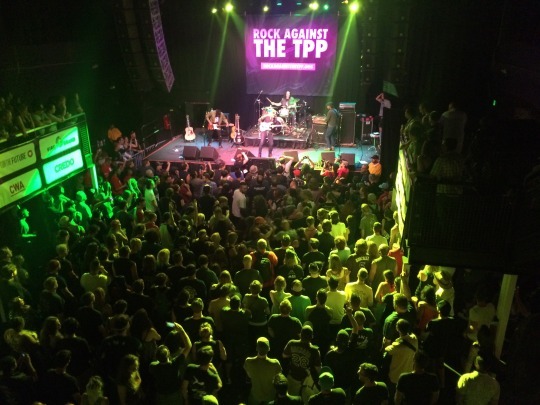 WHAT: The day will kick off at 5pm with a teach-in and training hosted by Evangeline Lilly, followed by the Rock Against the TPP concert from 6pm to 11:30pm. WHO: Talib Kweli, Evangeline Lilly, Anti-Flag (acoustic), Makana, Downtown Boys, Danbert Nobacon of Chumbawamba, Son of Nun, Ryan Harvey, bell’s roar, Taina Asili, Evan Greer, and more.